Hunting with large-caliber airguns has been gaining a lot of traction in recent years, and in 2008, Missouri for the first time allowed such guns to be used during the deer rifle season. 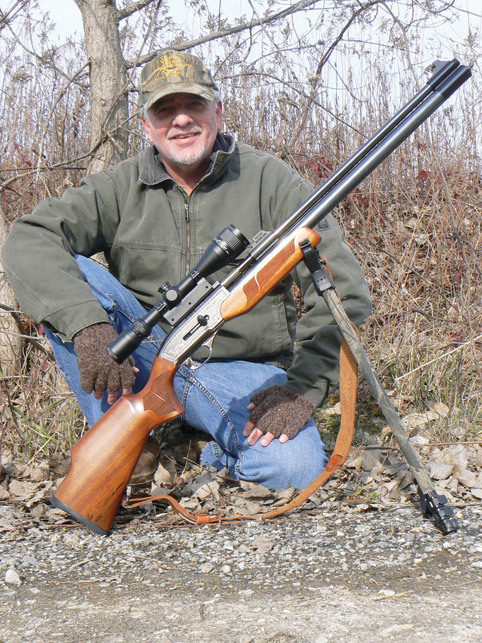 A couple of years before, Missouri hunter and airgun enthusiast Ken Cox began a lobbying campaign to get the big-bore airguns on the books in the “Show Me State.” He came with well-reasoned arguments, piles of data on the guns, the ballistics, and hunting experiences from around the world that demonstrated the guns are, indeed, appropriate for deer-sized game. Missouri officials decided to allow airguns for deer, with a concise and well-written regulation. The gun must be at least 40 caliber, and it must be a high-powered gun filled by means of an external air source—in other words, a precharged pneumatic power plant. Smaller calibers and less powerful spring-piston guns may not be used. I wanted to support the airgun-friendly state and decided to hunt deer in Missouri. The question of where to hunt was answered while talking to Texas-based hunting buddy Eric Henderson. He’d hunted during the inaugural season the year before, on property owned by big-bore airgun builder Brian Cook. Having no shame, I asked if he could hook me up. A couple of days later, I got a call saying I could “come on down” and hunt at the Cook family property, situated north of St. Joseph by the Kansas border. Eric and Brian were going to be in Texas for a big-bore airgun competition on opening day but would drive up and join me for the second day. I hit the road early, and they started late, which resulted in my arriving at the farm several hours before they did. But the Cooks had a room ready for me, and after getting to know the good folks, I settled in and arranged my gear. A little after 6 the next morning, I met Brian’s dad, Dwayne, downstairs, and we headed to a stand he had scouted for me. In the dark, we hiked down a hill, across a small bridge and through the woods before reaching a bigger stream, which we rock-hopped across. I feared I was going to slip and take an early morning plunge but made it without incident. The morning was cold for fall in Missouri and a light rain was falling, which would shortly turn to snow. We pushed a buck then a few minutes later kicked up another. Finally, we reached the place where I was going to hunt, and Dwayne walked out leaving me to set up. It started to snow more heavily and seemed to be getting colder by the minute. As the light came up I found myself by an old fence line with a view of hillside and creek bottom for quite some distance. I set up my blind under a tree next to the fence, which permitted me to watch the approach from every direction but behind. The blind was simply a folding camp chair with a pop-up cover that enclosed me in the chair. I staked it to the ground and added a few branches to the frame to further break up the outline. There was a large zip-up shooting window in front and mesh viewing windows to the sides. After getting comfortable, I spent the first hour glassing without seeing any deer, though I heard several turkeys calling off in the distance. I thought I saw something down in the creek bottom and was intently scanning the area when a branch cracked to my left. I turned (the blind covered my movement) and saw a massive buck not more than 40 yards in front of me, slightly to my left. I slowly slid the binoculars to the ground and lifted the barrel of the rifle so it pointed through the shooting window. By then, the deer had moved farther to my left, and the end of the window opening blocked me from getting the cross hairs on target. I quietly unzipped the window so I could lean out to try for a shot, but the deer continued to move to the left. I may sound calm and collected as I relate this, but believe me, my heart was pounding. I sat back down, reached in the pack at my feet, pulled out a knife, and slowly cut a gash through the mesh window on the left so I could slip the gun out for a shot. By the time I was in position to shoot, all I could see was a haunch as the bruiser buck stepped behind a tree and was gone. I just shook my head, a little dejected, but a whole lot excited. Within minutes, another buck came drifting into view. This one was a respectable 6-pointer, but the rules of the season mandated at least one side with four or more points, so I held fire. The gun I had brought for the hunt was a Sam Yang Big Bore 909S, a .45 that airgun tuner Bob Marino had set up with a bias for power over shot count. It was generating about 325 foot-pounds at the muzzle. I had taken several big game animals with the double-air-reservoir version of this same gun, and I liked the handling, looks, and performance of the single-reservoir even better. The guns are distributed in the United States by Pyramyd Airguns and represent good value for the money. A Hawke 3-9x 40mm scope topped the gun, sighted in using BHD 200-grain cast bullets. The combination worked very well, allowing four full-power shots at approximately 830 feet a second. 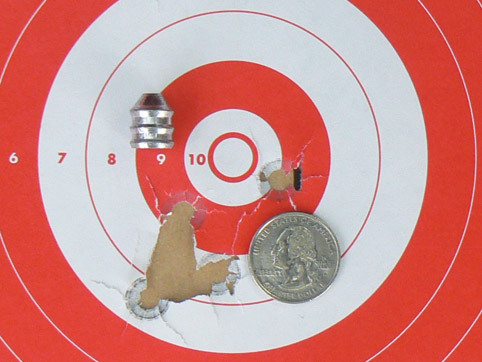 At 55 yards, the big bullets punched clover leafs in paper targets. Group shot at 55 yards using 200-grain BHD cast bullets in a custom-tuned .45 Sam Yang Big Bore 909S, with a fill pressure of 3,000 psi generating approximately 300 foot-pounds of energy. Air guns kill by punching holes, preferably large ones, through vital organs. They lack the hydrostatic shock associated with firearms, but with the right gun, bullet, range and shot placement, such guns are viable hunting tools for larger animals. The regulations in Missouri recognize this and ensure that an appropriate gun be used. I’d been in the blind for about a half-hour more when a doe came marching down the hillside and stopped at about 35 yards to browse. A second deer walked in behind, and I saw a flash of antler, but this buck stayed behind the doe where I could not get a good look. When the doe finally drifted aside, I brought the gun to shoulder, lined up the scope ... and saw only three points to a side. No matter how many times I counted, a forth point never showed up. As I watched the little buck, the doe started to nibble on a small tree at about 60 yards. The gun was poking through the recently vented mesh right at her, and it took no time to settle the cross hairs where I imagined the deer’s heart to be. I briefly debated whether to take a doe, but I wanted meat for the freezer, squeezed off the shot, and felt the characteristic recoil of a large caliber airgun, more of a gentle push than a sharp kick. The doe flinched and walked 10 yards before toppling over. At 50 yards, the precisely placed bullet had passed completely through, with more than adequate power to get the job done. Since I had two hours of shooting light and another tag left, I sat the blind rather than walk up on the dead deer. As the day rolled on, I saw more bucks (no shooters) and a couple more does. One doe actually stepped over her fallen sister, but I figured one for the freezer was plenty and decided to hold out for a last chance at a buck. It didn’t come, but I was more than happy as I dragged my doe to the trail, tagged her, and then hiked back to the house where I met up with Eric, Brian, and Dwayne. We went back and collected my doe; field dressed and hung her, and then caught up on the day’s events over dinner. I had to leave the next morning but got up early to see Brian and Eric off on their predawn hike to the blind, loaded up my deer, and then said goodbye to my congenial hosts. You may check a deer by phone in Missouri, which is very convenient, and I took advantage of this when I stopped for lunch. It took me 9 hours to drive home, where I dropped off my deer at the processor’s, returned the rented SUV, and visited with my family before turning in for the night. I would be leaving on another hunt the following morning. I’d driven 18 hours to hunt one day, and it had been well worth it. Seeing so many deer, including a monster buck that walked right by, and collecting my first Missouri deer with an air rifle, was a treat. I believe Missouri has become the premiere destination for big-bore airgun hunters in the United States. My hunt next season is already in the works.